Explore a new way to control the solar protection devices. 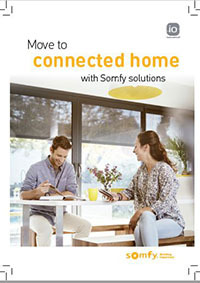 Just using a smartphone, the Connexoon Windows RTS application controls Somfy motorised solutions such as interior blinds, curtains, and rolling shutters, in just one click. Intuitive, smart, playful and in keeping with the times. 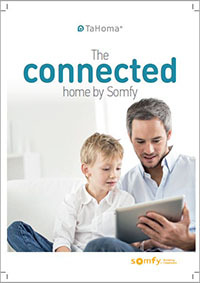 Somfy has created Home Motion. The dream becomes reality: motors, controls, automatic systems and alarms interact to get the whole house moving. With a touch on your remote control or mobile phone you can close all the entrances to the house, and activate the alarm system. Relaxing, far from home. When you leave, you’ll worry about nothing since TaHoma takes care of everything. 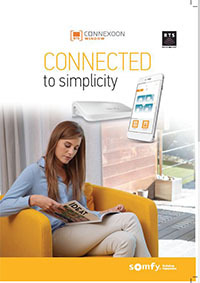 Indicates an internet connection is necessary to download brochures. To view an Acrobat document (PDF) you need to have the Adobe Reader software installed. If not installed, the software is free and downloadable from Adobe's website.